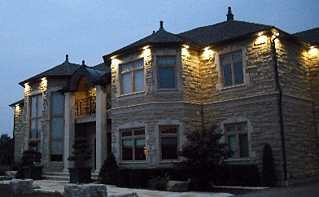 It's very common practice to use soffit lights to light the exterior facade of a home. Contrary to popular belief, this is not the best way to do it. 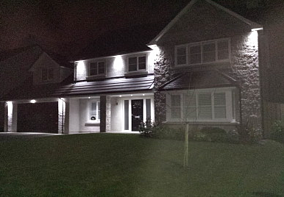 It's impossible to light every aspect of your facade using soffit mounted lighting. Read more on why we almost always recommend ground mounted up lighting versus soffit mounted down lighting. Natural light comes from above, from the sun. When lighting from the ground up, the effect is unnatural and thus more noticeable to the human eye. Ground mounted fixtures that up light the the exterior of the home are more eye catching and more noticeable than soffit mounted down lights. As a result, the eye is drawn up, which emphasizes the scale of the home. Soffit lights are recessed and do the opposite; they pool light on the ground and draw the eye down. Soffit down lights leave the soffit and fascia of the home dark except for the bright, intrusive light of the soffit light itself. The lighting effect we want is known as "grazing". Grazing is a technique used to emphasize a textured surface or architectural element (a stone or brick wall, for example). It's achieved by placing a light source close to the surface, usually 12”-24” out, with the fixture parallel to that surface. The effect this has is to softly illuminate the surface in a visually pleasing way. Soffit lights are stuck in the soffit; you couldn’t move them if you wanted to. The distance between the light source and the home’s facade are extremely close, 2"-3" out, and results in harsh, bright spots that fail to properly display your home. Ground mounted lights are not fixed; they can be adjusted as necessary for the best effect. The above examples show less than ideal soffit downlighting. In each example the source of light is visible, causes hot spots on the surface, and doesn't accentuate the architecture of the home. 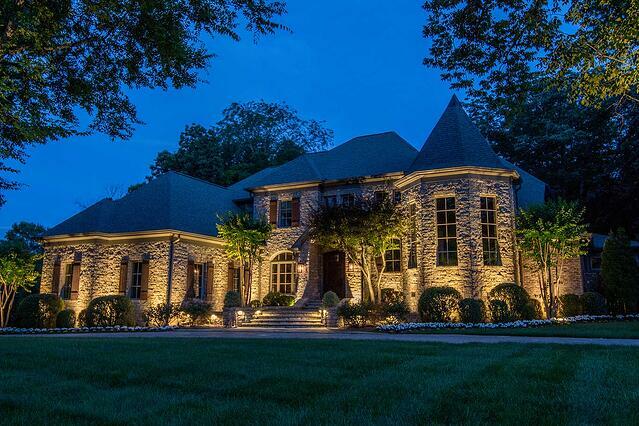 Lighting the gables on the home is crucial for any well balanced architectural lighting design. Gables are the triangular peaks between the edges of intersecting roof pitches. Most homes have gables, but because soffit lights are affixed to the the underside of the eaves, they fail to light them by design. 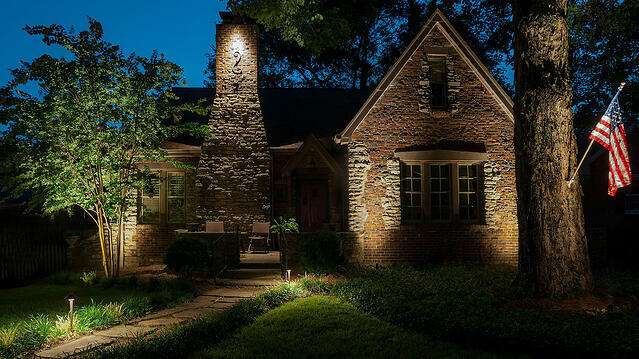 When a home doesn't have gable lighting, the scale of the home is lost, you can't view the most interesting architectural elements of the home, and the house can look unnatural and cut off after the first story. When are recessed soffit lights appropriate? 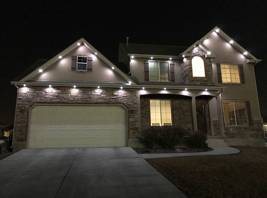 Soffit lights aren’t all bad, and sometimes they can offer the most cost effective solution, as in lighting around garage doors. 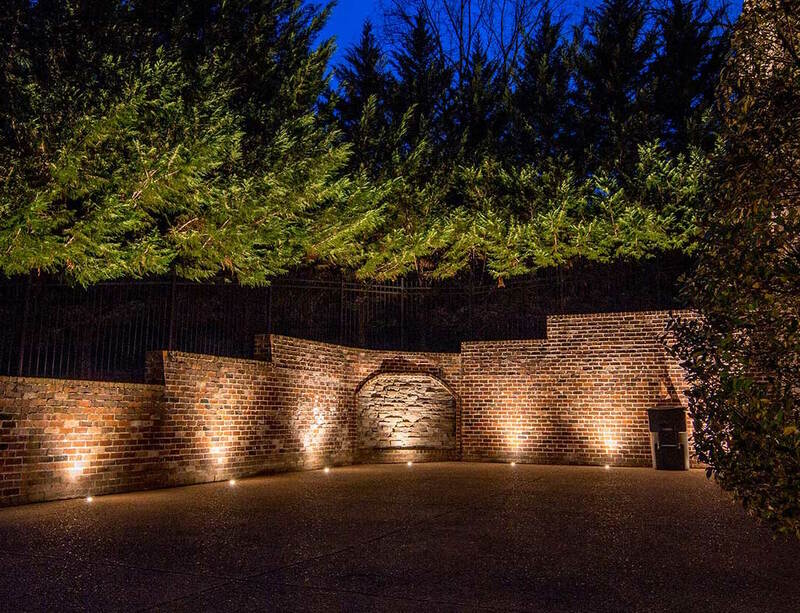 With a concrete driveway in the way, ground mounted up lights can be tricky to install. 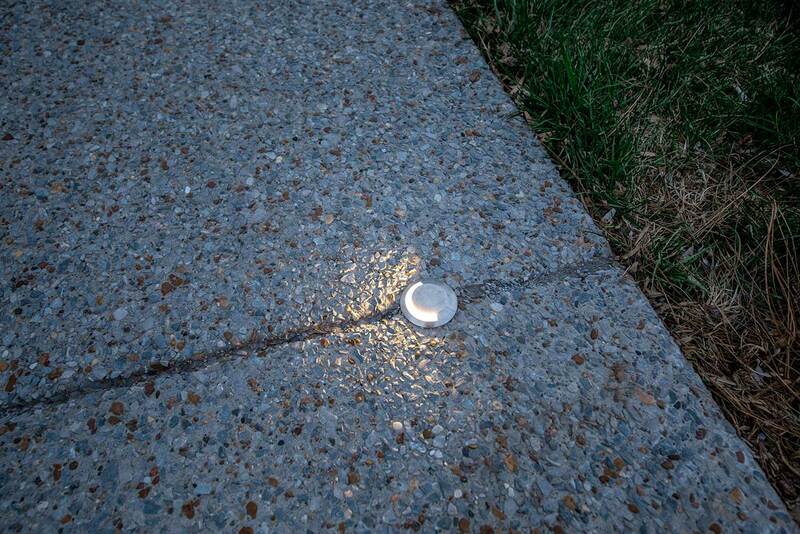 Recessed well lights are best, but can be costly as they require core drilling through the concrete. 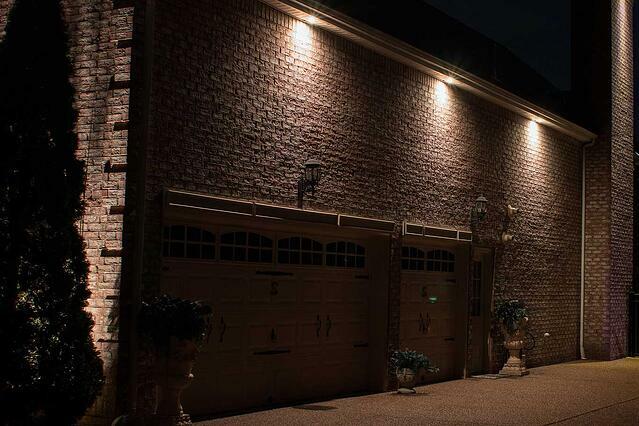 For people concerned with cost, soffit lights can be a solution. Soffit lights have their place, but more often than not, ground mounted up lights are the best way to light the exterior of a home or building. If you're interested in learning more about the differences in soffit and ground mounted lights, get in contact with us!